Professional surfer Carissa Moore, age 23, is a three-time world surfing champion: 2011 (the youngest female to earn the title at age 18), 2013 and again in 2015. She also was ASP rookie of the year in 2010, one of Glamour Magazines “Women of the Year” in 2013, and she was inducted into the Surfers Hall of Fame in 2014. The list of incredible accomplishments goes on… she even has an actual day named after her. 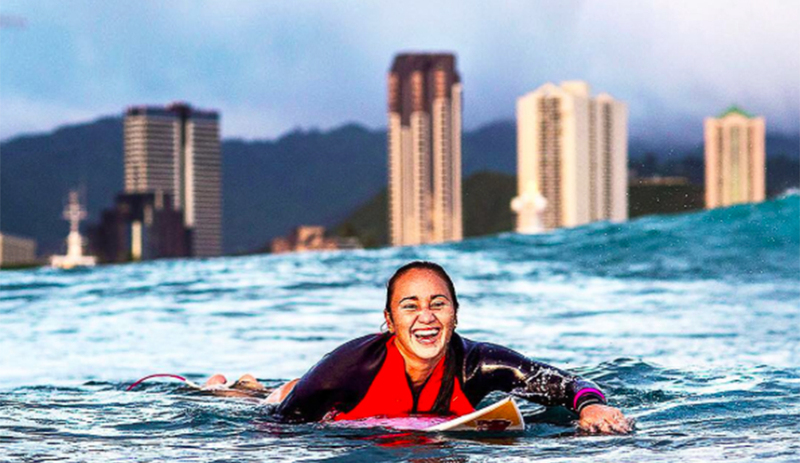 That’s right, mark your calendars, January 4th is Carissa Moore Day in Hawaii, a day she declares is to: “Do something that makes your heart and soul happy. This woman radiates aloha vibes and has a smile that lifts your spirit. She is currently charging on her seventh year on tour, traveling all over the world for nine months competing among the top 17 women surfers to do what she loves, surf. CM: I don’t know if there is one moment in particular. Growing up and just spending time with my dad in the water everyday, playing at the beach really got me hooked. Surfing became my happy place, my escape. AK: You are a remarkable athlete with a humble demeanor plus you are a leader and role model for lady surfers. Who inspires you? Are there other athletes and/or sports that you follow? AK: You are inspiring! You are also genuinely sweet, and you have some serious courage and bravery. Charging waves bigger than buildings, performing in front of crowds that reach over 50,000, and 100,000+ online viewers at www.worldsurfleague.com (app: wsl with over a million subscribers just last year). Where do you pull this courage from? CM: The truth is I still get scared/ nervous all the time! When things are challenging, I focus on my breath and the moment. Stress comes from worrying about the unknown. I try my best to trust in my ability and let go. One of my favorite quotes: “The comfort zone is a beautiful place but nothing ever grows there.” When I start doubting and want to run away and hide, I think about this. The best things happen when you step outside your comfort zone. AK: Your physique rocks, you have a presence of powerful beauty both on the outside and the inside! What’s your training routine? Photo: Instagram @rissmoore10 @corepoweryoga @nike. CM: Haha, thank you! You just made me smile so big. I surf almost everyday, do yoga three times a week and train with a trainer three times a week. We focus my training around core strength, agility, speed and cardio. I love cardio! AK: As women we sometimes look in the mirror and focus on our flaws. It’s so important to see and appreciate what we DO love about ourselves, our body, and our whole being. What do you love most about your body right now, and why? CM: I love my arms because they are strong and help me paddle fast. AK: How do you stay grounded while you are traveling nine months of the year? CM: I have an amazing support team. I wouldn’t be able to do what I do without my family, friends and incredible sponsors. It’s all about feeling comfortable and at home on the road and they do just that. AK: You have an unwavering elegance mixed with power to your surfing style and an unstoppable focus. How do you fuel up physically and mentally? Moore is never afraid to go above the lip. Photo: Instagram @rissmoore10 Credit: Trevor Moran @tallteef. CM: I think it’s all about balance. I’m a very emotional surfer so being in a good mental space is key. If my mind is in the right place, my body will follow. Having people that make me feel relaxed and comfortable helps me to perform at my best. Working hard and surfing a lot definitely gives me confidence but taking time to rest refuels my hunger and drive as well. AK: What’s your favorite food; that you can’t live without? Do you follow a particular nutrition routine? CM: I love gelato! My diet is pretty balanced. I enjoy a good salad and protein but also love carbs and a good dessert too. Everything in moderation works best for me. AK: You’ve had some epic wins but also losses along the way. How do you analyze the losses to turn it around and be positive… and be a champion? CM: Losing is hard. I get pretty negative on myself. I cry. I get mad and irrational. I let myself feel all that I need to feel then I go back to the drawing board and take what I can from the situation to be better. When you lose, you have two options: beat yourself up and give up or learn from it and move forward. Everything happens for a reason. Embrace the journey. AK: Thinking back on your career so far, is there a specific event, contest, or memory that you would claim to be your most cherished highlight? 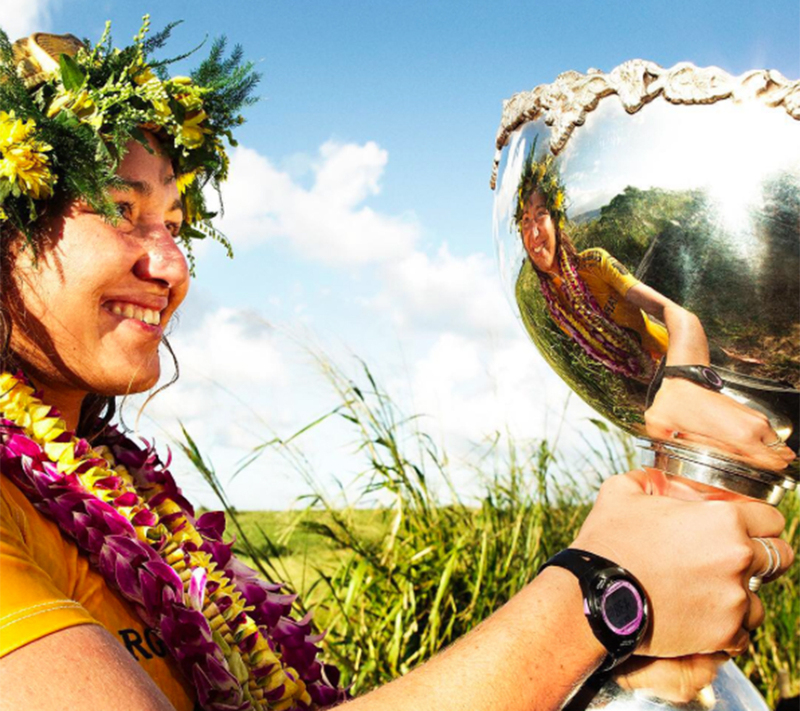 Carissa clinching the 2015 world title in Maui. Photo: Instagram @hurley. CM: Winning the Target Maui Pro last year and the World Title at home in front of my family and friends has to be one of the highlights of my life. It was so special to be surrounded by so much love and good energy. Things just fell into place and I felt like I could really let go and perform the way I wanted to. AK: You have traveled around the world surfing. I’m sure it’s hard to pick just one, but if you could go anywhere right now to surf, where would it be? CM: Home! I’m so lucky to have grown up on the beautiful island of Oahu where we always have fun waves to surf. CM: Yes! I still have those moments that I compare myself to others and get down all the time. Comparison is an unnecessary evil but totally normal, haha. Just don’t take yourself to a negative place and try your best to focus on yourself and your growth. “The urge is to quit is greatest right before you’re about to succeed.” It’s those moments that you feel like giving up that provide clarity to what you really want and inspires you to be better and strive for more. AK: Is there anything else you would like to share with The Inertia and our followers?